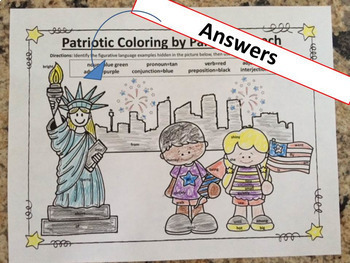 In this fun set of coloring pages for July 4th, Memorial Day, and Veterans' Day, students are are working on standards while coloring!! 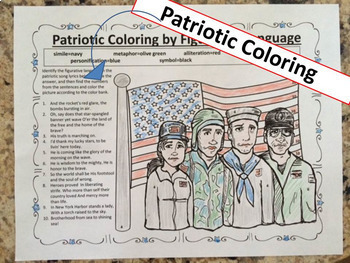 Students must identify the parts of speech or figurative language used in sentences or patriotic-themed song lyrics in order to complete the coloring pages. Answers and suggestions for use are included! 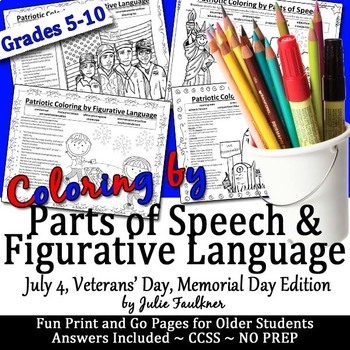 Great for literacy centers, substitute plans, or end of year! Looking for more of these creative grammar practice pages? Be the first to know about my new discounts, freebies and product launches. Look for the green star next to my store logo and click it to FOLLOW ME. Presto! You will now receive email updates about my store.